UPDATE: Full press release on Taj’s win now under the cut with rankings, points and details. 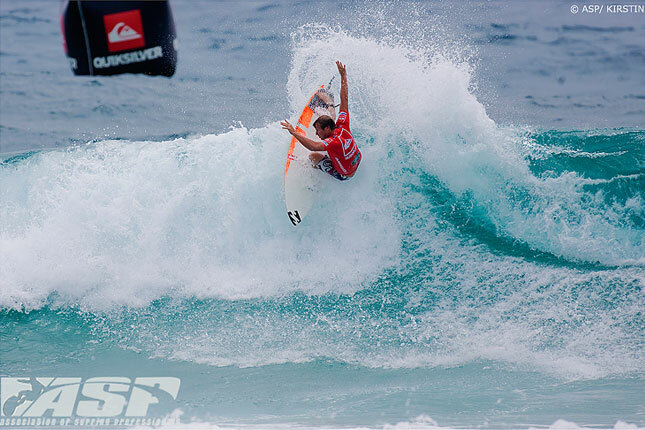 The Quiksilver Pro finals just finished and Taj Burrow beat out Jordy Smith for the win. Taj Burrow finished on 15.57, while Jordy came out with 12.56. Pictured: Taj Burrow (AUS), 31, has won the Quiksilver Pro Gold Coast! SNAPPER ROCKS, Queensland/Australia (Friday, March 5, 2010) – Taj Burrow (AUS), 31 has taken out the Quiksilver Pro Gold Coast presented by Land Rover over Jordy Smith (ZAF), 22, in rippable two-to-three foot (1 metre) waves at Snapper Rocks. The opening event of then 2010 ASP World Tour season, the Quiksilver Pro Gold Coast started the year off with a bang, bringing the greatest assemblage of surfing talent in history to one of the most iconic pointbreaks in the world, and the world’s best surfers shattered high-performance barriers once again. Smith, who went on a giant-killing spree at the event, eliminating former nine-time ASP World Champion Kelly Slater (USA), 38, in yesterday’s Round 4 before posting the best result of his young career. Long touted as one of the most dominant forces in the surfing world, Smith had yet to realize his potential in the competitive realm, but if this event’s performance is any indication, the powerful natural-footer is a near-certain threat for an ASP World Title. Dane Reynolds (USA), 24, looked the form surfer of the event yesterday, defeating defending event winner Joel Parkinson (AUS), 28, with an impressive 19.20 out of a possible 20. However, the young Californian was unable to find a rhythm in today’s challenging conditions, bowing out of the event with an Equal 3rd at the hands of Smith. Bobby Martinez (USA), 27, matched his best result on the Gold Coast today, collecting an Equal 3rd (his first in 2006), but the sole goofy-footer in today’s event was clearly upset about the deteriorated conditions. For the first time in the events’ storied nine-year history, the Quiksilver Pro Gold Coast was televised LIVE on FUEL TV in Australia, beaming the world’s best surfing right into your living room.